Do you take a lot of road trips or spend a lot of time in your car driving kids to and from activities and school? Did you know you can save a lot of money and prevent major repairs by performing routine maintenance? Do you know what things you should be checking and replacing? If not, you’ll find some helpful information in today’s post. 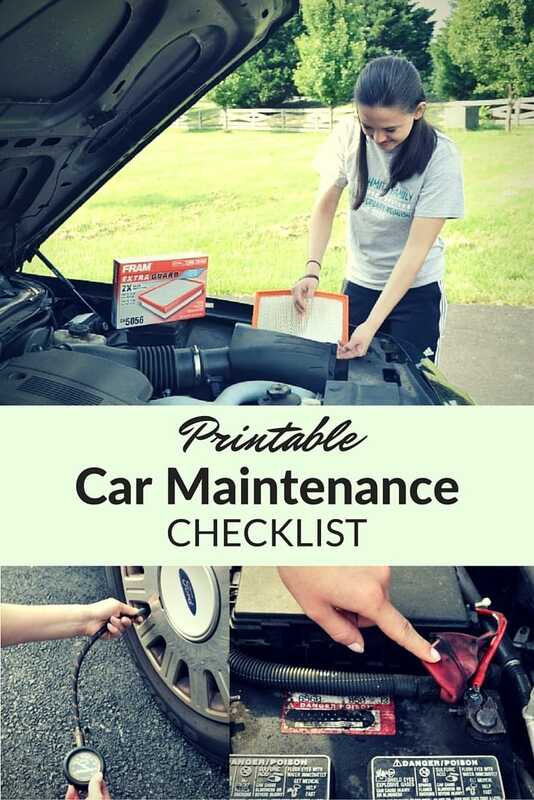 Later in the post you’ll also find a free printable car maintenance checklist to keep in your vehicle(s) to remind you when to do what. I wish I could take credit for the condition of our vehicles, but the truth is my family has my husband to thank. He has always been good about making sure we do routine checks and maintenance on all of our vehicles to ward off expensive repairs or unexpected car trouble down the road (Haha! Double entendre. Did you catch it?). He made sure I, and our teen drivers, know how to perform all of the routine maintenance to: 1) save money and 2) help us understand how our vehicles function. Most of it is easier than you think! Important Note: You should always consult your vehicle’s owner manual for maintenance guidelines specific to your vehicle. The recommendations within this post are GENERAL guidelines. Each month you should check fluid levels and general condition of the car. It only takes a few minutes to check everything and once you know where to look and what to look for, it’s so easy that even a novice teen driver can do it without assistance. 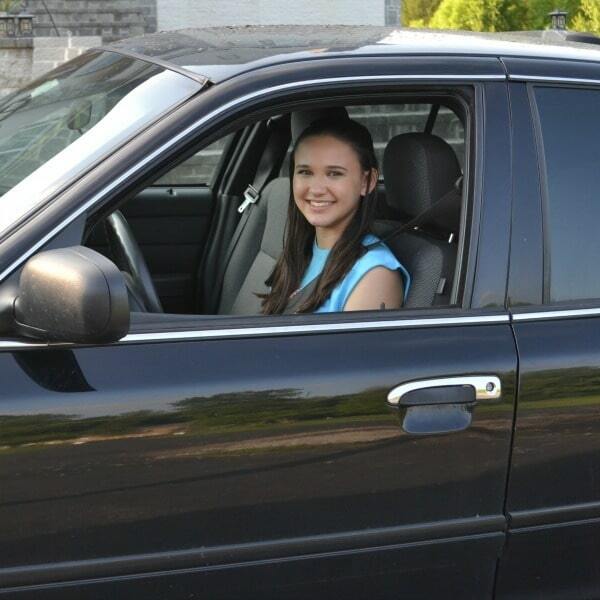 To demonstrate, I enlisted the help of my 16-year old daughter who gets her license in a few weeks. The brake fluid reservoir is typically located under the hood near where the brake sits on the opposite side of the wall. In newer cars it is usually a translucent container that is marked with a fill line. 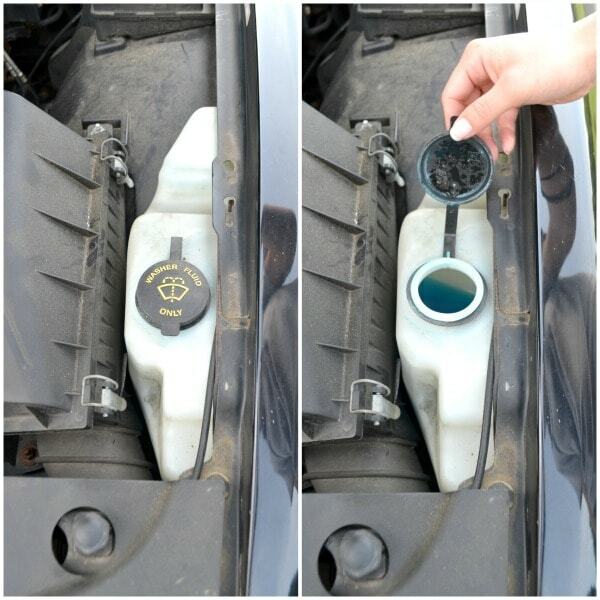 A quick glance can tell you if the brake fluid is low. If it is, you just need to unscrew the cap on the top of the reservoir and add fluid to the fill line. The reservoir for coolant (aka “antifreeze”) looks similar to the brake fluid reservoir and is also usually marked with a fill line. In most cars, it sits near the front of the car. In the picture below my daughter is pointing to the fluid level which, since it is full, doesn’t need anything added right now. My first car was a Chevrolet Citation with a slow oil leak. One of the few things I learned to do (before my husband taught me everything I know about vehicle maintenance) was how to check the engine oil level. Once you locate the dipstick, you simply need to pull it out, wipe it clean, then push it back in all the way and withdraw it again. At the end of the stick are lines indicating the ideal range for your oil level. If it doesn’t pass the first line (closest to the tip of the stick), you need to add engine oil. You don’t want to wait until an officer pulls you over to realize you have a tail light out. Or worse, you don’t want to be driving at night and realize you can’t see the road ahead of you because one of your headlights is out or they are too dirty for the light to illuminate the road ahead. Once a month it’s a good idea to leave the car running when you return home one night and walk around the car to inspect the lights. 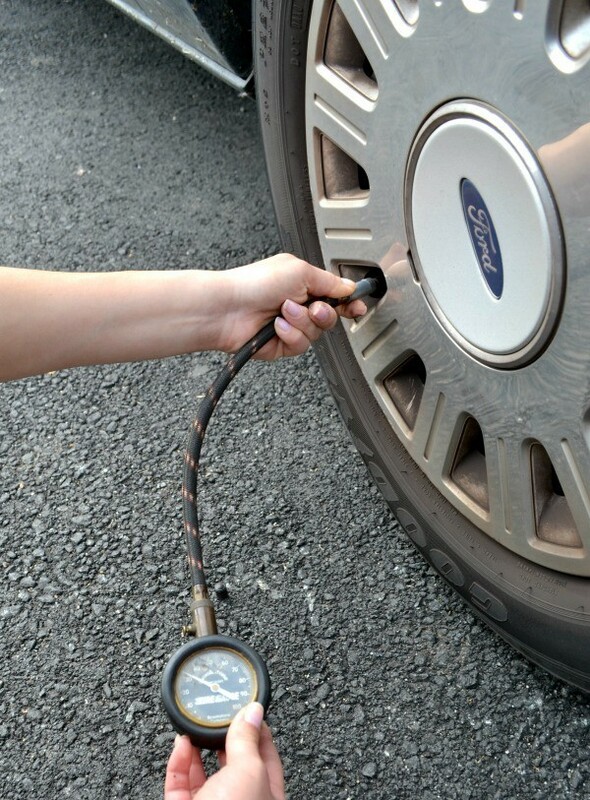 Properly inflated tires result in better performance and better gas mileage. While you’re checking the tire pressure, it’s also a good idea to check out the tread on the tires to see if they are worn or wearing unevenly indicating that it’s time for a wheel alignment or tire rotation. Unlike brake fluid or engine fluid, your car can function relatively well even if you run out of windshield washer fluid. But as long as you’re checking the other fluid levels, it only takes a quick peek to see if you need to add more so we include this in our monthly inspections. It only takes a minute to lift up your wipers and inspect the blades for damage or debris that will interfere with their windshield wiping efficiency. You can do this yourself, but if you have a car that sits low to the ground it can be a pain. And as long as you’re checking and filling all of your own fluids, a routine oil change is usually inexpensive. What good is putting nice, clean oil in your vehicle if it has to travel through a dirty filter clogged with old oil? 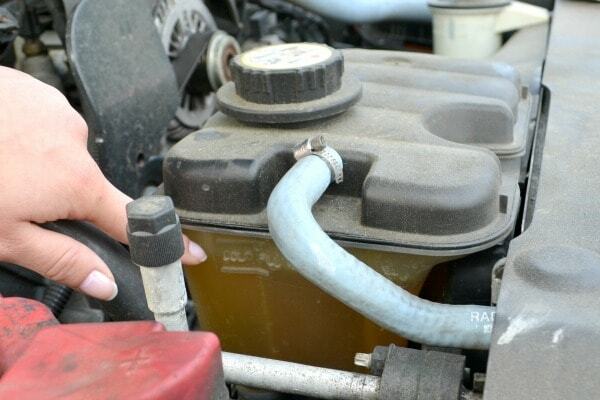 Each time you change your oil (or have it changed), you should also replace the oil filter. Checking the automatic transmission fluid is similar to checking your engine oil. In fact, if you don’t know much about cars, it’s easy to confuse the two dipsticks. The process to check is the same: pull it out, wipe it clean, reinsert, pull out and check. 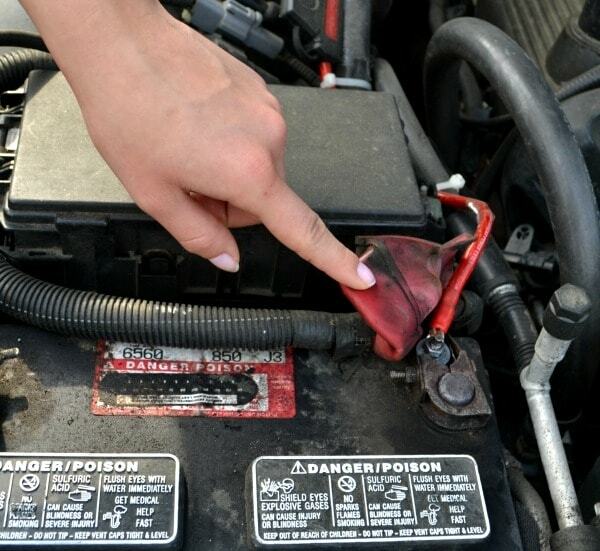 While you’re under the hood checking the transmission fluid, go ahead and check the cables connected to the battery. Sometimes, like ours, they are covered with a protective rubber casing that you have to pull back. You’re looking for signs of corrosion or loose connections. Either one will impact the flow of electricity and the operation of your vehicle. Your power steering fluid reservoir should be clearly labeled. To check it, just unscrew the cap and check the fluid level on the dipstick, which should be labeled in some way indicating a minimum and maximum fill line. If it’s below or near the minimum, you just need to add more fluid to the reservoir. Modern serpentine belts don’t require a lot of maintenance but they should be checked periodically since they don’t last forever. You basically want to check to make sure the belt doesn’t have any tears, bumps, or small holes. Also watch out for belts that appear oily or glazed since they might slip, which will affect how effectively the engine is cooled. Again, as long as you are under the hood with a critical eye, go ahead and look over all of the hoses to make sure there aren’t any cracks in them. This is another one of those things that because it involves crawling under the car, I prefer to let someone else do. I’m listing it here though so that when the oil change guy gives you a long list of “recommended” maintenance, you’ll know this one is legit. You’ll have some idea if you need it because you’ll hear the squeaking in your suspension. The cabin air filter helps keep the air inside your vehicle clean. You can usually find it either behind the glove compartment or under the dashboard. If you have allergies, you really need to remember to change it. Also, dirty air makes your air conditioner work harder. Just like we need clean air to function our best, so do our car engines. 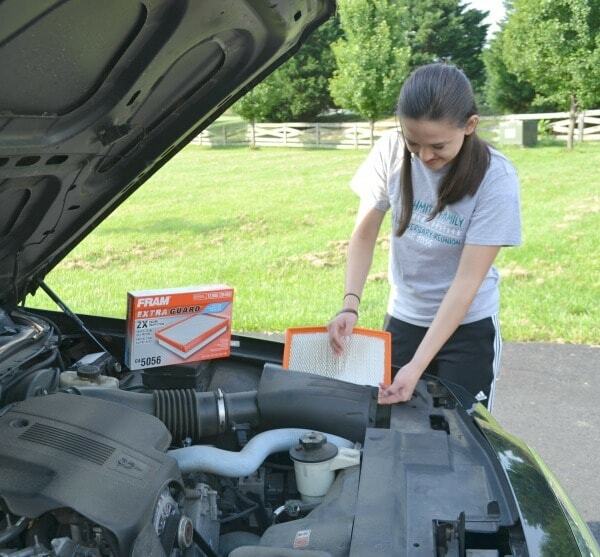 Your engine air filter protects your engine from dirt and dust that can damage it. Some benefits of a clean air filter are: increased acceleration, horsepower, and improved overall engine performance. Unlike the oil filter, it doesn’t need to be changed frequently. Once per year should be sufficient (follow recommended change intervals as noted in your vehicle owner’s manual) to keep your engine running smoothly. This is one of the easiest maintenance tasks too so definitely don’t pay someone else to do it. Installation takes just a few minutes. You just release the clips holding the filter casing closed, remove the old filter, and slide the new one in. To properly check your brakes and wheel bearings, you need to remove the tires. Unless you have a lift at your home or really want to take turns jacking up your car and removing each tire, this is another job that can be outsourced. You should be getting your tires rotated about twice a year so make sure the person who rotates your tires checks the brakes and wheel bearings then. The reason you need to flush your coolant is that all that aluminum in engines causes corrosion so eventually the corrosion protection in your coolant wears out. You can actually go at least two years in most climates between coolant flushings, but I’m adding it to the annual list just to remind you that it needs to be done periodically. This is another under-the-car, requires a jack project. Also, unless you know what you’re looking at, it can be tough to identify problems. Steering and suspension definitely affect the comfort of your drive so it’s important to check (or have someone check) for worn struts or shocks, or a problem with a tie rod end. Your vehicle shouldn’t need its hinges to be lubricated often, but once a year it’s a good idea to check for creaks and take the minute or two to grease them. 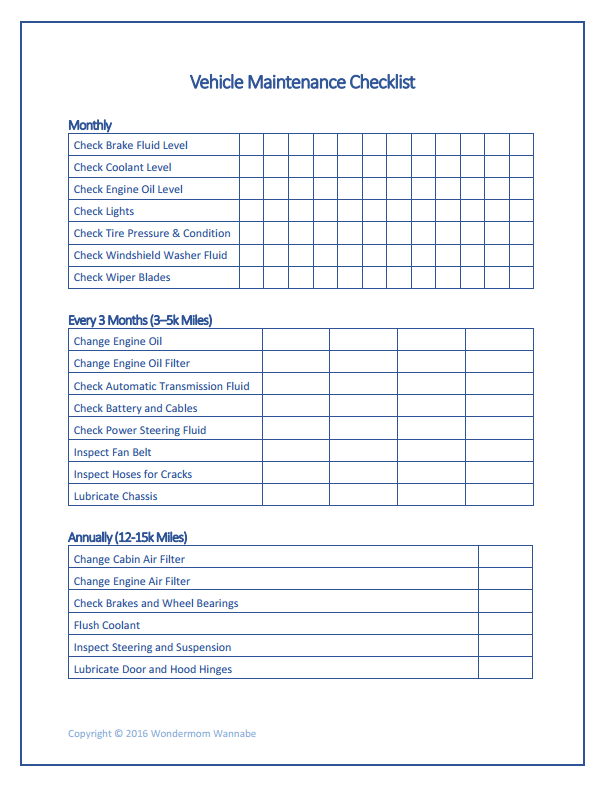 Here’s a free printable version of the checklist that you can keep in your vehicle. Just check off or write in the date of each task as you complete them. Aside from the general maintenance tips I’ve shared above, there are a few other things to pay attention to when you’re preparing to take a lot of road trips. Summer is a popular time for families to travel by car. If you plan to hit the road this summer, check out these resources to ensure your vehicle is in top condition before traveling. 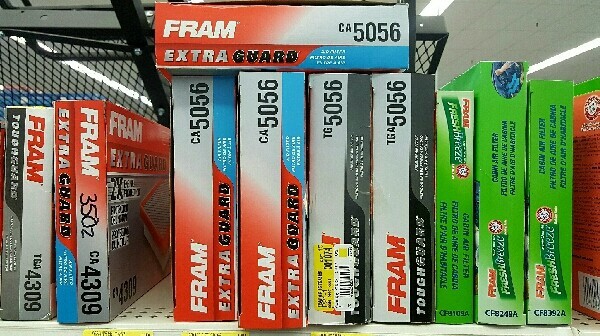 FRAM Summer Car Care – Find tips on everything from trunk organization to DIY waterproof car seat covers. Best Apps for Road Trips – My favorite travel apps to help me locate the restaurants, the cheapest gas, or wi-fi on the road. Family Travel Sanity Savers – My family’s favorite games and activities for passing time in the car. I can be so negelectful of my car! Thanks for this super helpful printable – printing it now and putting it in my car. Speaking of… I need to get my oil changed! What a great list. I think it is so important to keep yup with the maintenance of your car – saves money and makes it last so much longer. I am glad your husband was thoughtful enough o ensure your entire family can deal with the maintenance of the family cars.